The first of the three sounds constituting the sacred Syllable vkse contains the symbol of Vishnu, the second one that of Maheshwar and the third one symbolizes Brahma. All the three Brahma, Vishnu and Mahesh are in the Pranava. This is the beginning, the end, and the middle. This is a holy exclamation at the beginning and end of reading of the Vedas or prior to the commencement of a prayer, mantra or scared work. The resounding sound which occurs when is uttered, in itself, is the sound of assent, respectful affirmation, removal or warding off of all evils and every obstacle. This is the ‘AKASH’ Tatwa and it is similar to the sound of a good ‘conch-shell’. It is ruled by the Planet Jupiter and the sound helps not only in the rectifying the hearing problems but in all matters connected to the Vata disorders particularly the troubles caused by the entities living in the 4th dimensions. Constant thinking of ‘Pranav’ releases the energy in body. The kindling of the Kundalini from its sleeping state, and then it starts to move upwards and passes through the various Chakras resulting in the evolvement and attainment of Maya by endowing one with the Ashta Siddhis and Nava Niddhis and then the ultimate Moksha, the freedom from the cycle of life and death. Depending upon the right and capability of a person the worship is done as the Saguna – Nirguna Bheda as well as ‘Abheda’. “One which is completed through the inhaling and exhaling of breath, which is not uttered as Japa but still is a Japa, that is called the Ajapajap”. The ‘Kumbhak (stopping of Breath) in between the two is the ardhachandra and it brings to consciousness the process of breathing. This element which comprises the two letters and (Sa) and the ardhachandra is the Kalpa Vriksha, the Mahamantra of Shri Vidya. This is visible and takes form during the meditation of Ardha – Narishwar Shiva in the form of Guru. One whose formation is like illumination of the Rising Sun and Lightening; one who holds in his four arms – Pasha and Parshu and shows the Abhaya Mudra and Vara Mudra, respectively. Who is enthroned on a throne embedded with unparalleled lustrous Gems and is the Universal (root) cause of the Universe – Such a peaceful as well as Ugra (fiery looking) or Agnishowm with three eyes – Chandra Chuda (with the Crescent Moon on his forehead). The Supreme Power, Bhagwan Ardha Narishwar – half Iswar and the other half in the Female form, the Almighty God protect us. This is the book about which to write or say anything is like showing candle to the Rising Sun. Many learned scholars had commented and translated this book, originally in Sanskrit, into various languages prevailing in India. This well known book Phaldeepika was created in the 12th Century by Mantreshwar who was the greatest of all the Astrologers of his time. He took up the Astrological Principles prevailing and propagated by great sages like Maharishi Parashar, Gemini and many more. 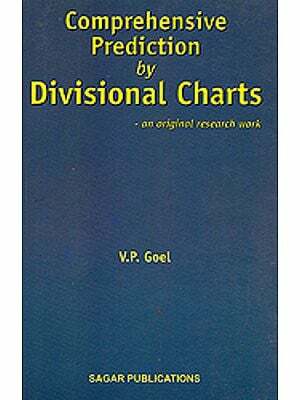 A few decades ago this book was only available in the local languages prevailing in the South India and was not available to the vast majority of the Hindi speaking people in the North India. Then the learned Pandit Gopesh Kumar Ojha commented and translated it, 50 years ago, in the Devnagri Script (Hindi language) for the benefit of the Hindi – knowing persons. Now I, his son Pandit Ashutosh Ojha have the opportunity to present it in the present set-up to the English speaking people. The 225 Principles of the “Bhavarth Ratnakar” which was earlier in the Hindi Edition are also present in this English work. From our side we have given some more examples and illustrations which were not in the Hindi Version so that the book in itself is complete. The present book Bhavartha Bodhini Phaldeepika was in the 12th/13th Century written by Mantreshwar. Mantreswar was a Siddha Purush an evolved soul. He was a well read person and was successful in Tantra-Shastra as such he was called Mantreshwar with the Blessings of the lords of the Mantras. Pandit Gopesh Kumar Ojha was a scholar of Sanskrit, English, Persian and many other Indian languages. He came from a traditional family of the learned Pandits who were the Gurus of the Maharajas of Alwar (Rajasthan) in India. Many years ago he thought of writing the not so far available ‘Phaldeepika’ to the Hindi knowing people which was available either in Sanskrit or in some other languages prevailing in South India. Some part of the original was in coded language just like a hint in solving a puzzle so Panditji thought of enriching the translation with his deep knowledge of the subject matter and presenting it for us in a simple and easy to understand manner. Bhavarthabodini Phaldeepika is one out of many other books like Jataka Parijata, Jataka Deshmang Chandrika etc. which he translated and gave his lucid commentary upon. 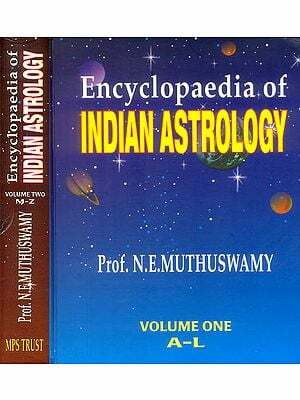 We have now brought out this present English Edition so that Astrology lovers in the West and those who are proficient in the English language can take advantage of the so far secret Principles of Vedic Astrology enshrined in Mantreshwar’s Phaldeepika. Astrologers know that the Karma of a person in the past lives has resulted in the present birth. We are here to bear the brunt or to enjoy the effects of stars. Still the God Almighty has given to us a Will to improve or tarnish our destiny. We refer here to the Chapter 26, Sloka No. 50 of Phaldeepika itself. One who does not want others to be killed, has control on his senses (behaviour and mind) and earns his living in a righteous manner, always follows the rules and principles laid down in the scriptures, the planets are always pleased with him i.e. are always favourable to him. Here we would like to quote the horoscope of Shri Ravana. He was Pandit of the Pandits. The most handsome, intelligent and eligible person and a victorious king, who not only conquered the Planets but defeated Lord Indra, the King of Gods. He used the planets as steps to climb to his throne. He had the blessings of lord Shiva. He was the person who could never be defeated, surrounded by good counselors and was a Brahmin of the highest class, son of Rishi Visravas and Kaikasi and grandson of Pulastya, with such a powerful horoscope which was no less than that of Shri Rama. He strayed from the path of religion and wanted Sita for himself. Sita the wife of Lord Rama had everything desirable in a woman but then Ravana’s own wife Mandodari was no less. The idea got imbibed in his mind that he should get Sita because whoever will marry her will be the king emperor. She was a beautiful woman endowed with all the qualities desirable in a woman – all the characteristics of a Padmini. Exalted Saturn in the 7th house gave Ravana a faithful, good looking wife. Exalted Mars in the 10th house made him conquer the world, the Moon and Jupiter in the 4th house in Cancer gave him the throne of Shri Lanka, the city of gold. But then the full aspect of Saturn and Mars on the first house and on his Sun (exalted) gave him the idea, the desire to possess Sita. No sooner he left the path of morality, religion and ethics, he become arrogant and his stars lost the luster and power. They become incapable to help him. He kicked his brother out and the significator of brother Mars became weak. Vibhishan brought about his fall and death. He would not listen to older people of his court, nor to his wife and his exalted Saturn lost the power and the strength to protect him. His Atma his soul became weak and got coloured so ultimately he was killed by Shri Rama. Lord Rama was the future king of Ayodhya – a warrior. The horoscope of Rama and Ravana are given. 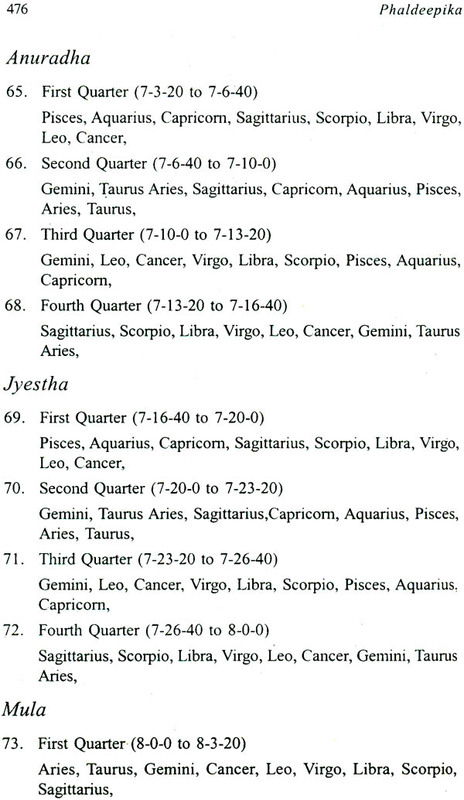 The difference between the two horoscopes is that the Rising sign of Rama was Cancer and that of Ravana was Aries. No doubt Rama was the Incarnation of Lord Vishnu but Ravana had the blessing of Lord Shiva. Why was Ravana defeated? The reason is not far to seek. He went astray from the path of religion and as soon as he abducted Sita his downfall started. Exalted Sun in the first house endowed Ravana with luster, Courage, anger and pride. ‘Pride has a fall’ and this applied to Shri Ravana. City of gold, palatial buildings existed. A faithful and loving wife too was there to comfort him. The question is raised why did he lose to Rama? The answer is clear in bold letters. Ravana due to his actions brought about his own doom. History indicates that Duryodhan threw his lustful eyes on Draupadi and so he got destroyed together with all the family and friends. Helen was abducted and Troy was burnt-Every time it happens but we do not learn from it. Their beauty became a curse not only for themselves but for those too who laid their eyes on them. That is the way the Maya operates. The purpose of indicating this is that many times people meet Astrologers and put up these questions why their horoscope is not showing good effect? The reason is that when we do certain deeds in life which weaken the ‘Karakas’, the Significators, then how can the planets show good effects? If you want your horoscope to show good then be on the path of religion. Do not do such things the loss of which will cause mental anguish to others. Every action bounces back. Turning out his brother – reduced the effect of his Mars. Not listening to his wife and advisers dulled his Venus, Moon and Saturn and going through the established norms he kidnapped the wife of Rama. On the other hand Rama never did anything against the established principles. Just because his father desired him to leave – he did and so he improved his Sun – Love and support of his brother Lakshman strengthened his Mars; Respect for spiritual and religious people improved his Jupiter and Saturn – Therefore with almost parallel horoscopes Rama triumphed and Ravana did not and the victor is always worshipped. Rama could not strike him in the Chest (the heart) as his Jupiter and moon were protecting him so he sent the arrow to his naval and his source of all energy (supposed to have nectar in his naval) dried out then his heads were cut by the blast of arrows. Many person with the Economic securities, forget the line of demarcation forget the moral principles of life they earn their wealth without any adherence to how they do it money is their God and then other evil creep in. they cast their lustful looks left and right and cause problems not only to others but for themselves. They do not take lesson from History. When Ravana could not accomplish his desires because it was against the structure of the society of that time then how can a frail person like us attain it. Even if for a moment we gain then against all odds it is a temporary gain and ends in mental anguish. They go to Astrologers and Babajis and want their help by using Vashikaran and what not. Their stars by their Karmas has already lost their hue and luster and how can they achieve anything. By one action all good effects of planets are washed out and by one deed – good deed even debilitated planets show effects like exalted planets. All this is written out for the learned reader to emphasize that Astrology is great, mathematical interpretations are fine but unless we follow the path of religion and keep the significators of different planets happy – good results will not come from a horoscope. I wish that readers will enjoy this version of the Bhavartha Bodhini Phaldeepika and in case of any doubts or clarifications will solve it themselves or get back to us. The present unique classical treatise has come into being for the first time for the benefit of the Hindi knowing population on account of the infinite grace of the Supreme Power of God Head. Earlier this work was available only in the South Indian languages in the litho form. The original Sanskrit text in ‘Dev Nagri’ format was published approximately 40 years ago from Calcutta and its commentary and notes were subsequently available in Tamil, Telgu, Kannada, Malyalam, Gujrati, English etc. yet its Hindi version did not exist. 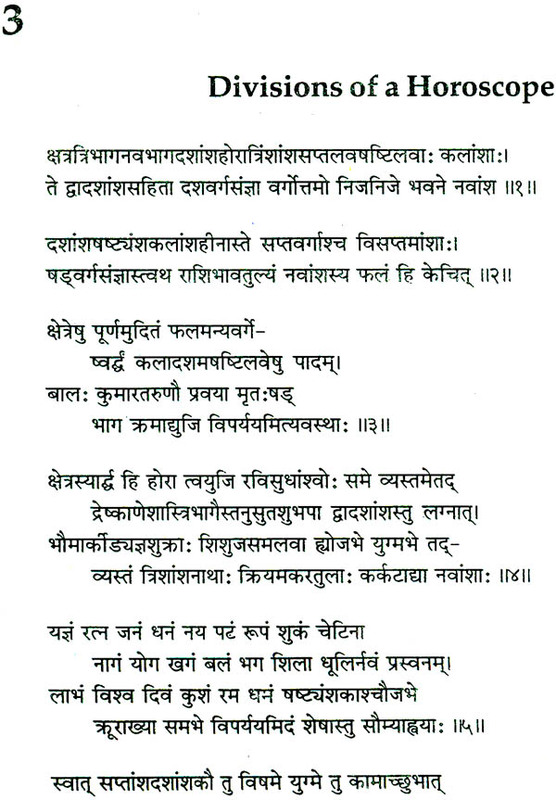 The present commentary highlights the meaning and substance of the Sanskrit text. It also elaborates the meanings of the twelve houses in a horoscope. Besides this we have added 450 yogas of the (Bhavarath Ratnakar Shri Ramanuja in the Hindi Version; so the title of ‘Bhavartha Bodhini Phaldeepika’ is an appropriate and most befitting title for the book. Shri Mantreshwar in his younger days was known as Markundeya Bhattardi. He was born in Southern India, in a Namboodari Brahmin family. One opinion is that his birthplace was ‘Shaveeti’ in the Tamil province. Another opinion is that his birthplace is Kerala. He was a worshipper of “Goddess Sukantala”. There are differences about his birth period as well. Some learned persons are of the opinion that his birth was in the 13 century A.D. and yet others are of the opinion that it was the 10th century A.D.
For intensive learning he traveled to ‘Bhadrikashram’ in the Himachal Pradesh and also lived in Mithila (Bihar) to gain the proximity of the learned scholars for quite a long time. He was a grand scholar of Nayaya, Vedanta etc., the six philosophies. He was constantly engaged in the rigorous rites of fasting, japas and yagyas and succeeded in mastering and attaining the proximity of the Presiding Deities of the mantras. His name then became ‘Mantreshwar’. He discarded his mortal body through ‘yoga’ at the age of the One hundred and fifty years. Due to the study of various types of learning and rigorous practices, his knowledge of Astrology was intense and unlimited and therefore the readers will come across such practical and unparalleled interpretations in ‘Phaldeepika’ that they will get enchanted. 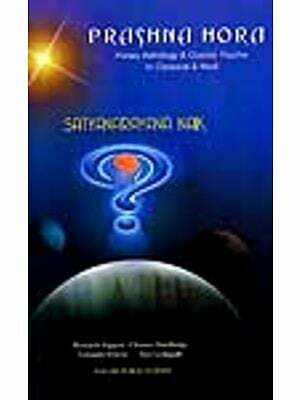 ‘Phaldeepika’ is a mature creation of Astrology. Together with the commentary. 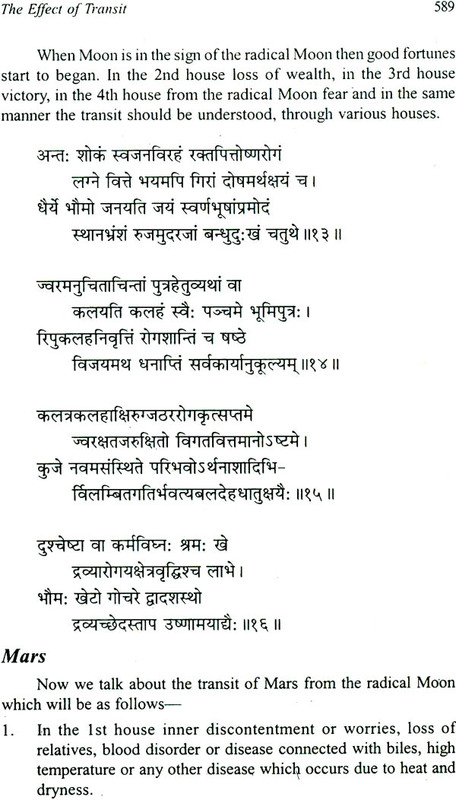 The original slokas has also been included so that the kind hearted Sanskrit knowing readers could also enjoy the beauty of original poetry enunciated by Mantreshwar. It is of no use to praise the grandeur, benefits and substance of this treatise as the present as the present book is in itself in front of the readers. Astrology throws light like a lamp illuminates the goods kept in darkness, i.e. the results of the good and bad ‘karma’ that one has done in his previous birth. 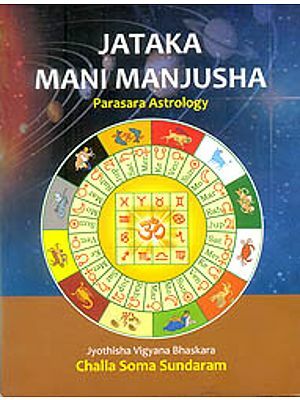 ‘Jyotish Kalpadrum’ has three divisions viz’ ‘Samhita’; ‘Siddhanta’ and ‘Hora’. The interpretations of birth charts and horary charts fall under ‘Hora’. ‘Phaldeepika’ was created to indicate the results of the past ‘Karma’. This is one of the best books on Predictive Astrology. It includes the essence of Parashar, Jaimini and many more masters. Four hundred and fifty Yogas of Bhavartha Ratnakar of Shri Ramanuja have been added to befit the title Phaldeepika: Bhavartha Bodhini. The 28 chapters in the book cover various topics: the characteristics, house divisions, strength of planets, career, various yogas, raja yogas, marriage, children, longevity, periodic influence of planets, the effect of transits and ashtakvargas. The 11th chapter exclusively deals with the nativity of women; the 22nd chapter gives the interpretations and calculation of the kalachakra dashas. This English edition also includes many horoscopes, tables and a glossary of Sanskrit and Hindi words. The language is easy to understand and even the beginners after studying this book for a few months will be able to arrive at the right interpretations and timing of events. Mantreshwar was the greatest astrology of 12th century from the South of India. 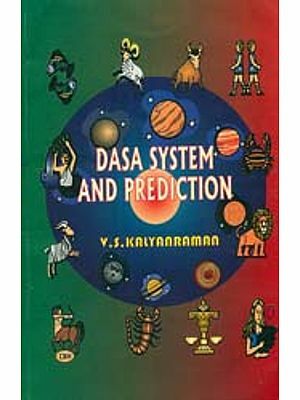 He compiled in Sanskrit the principles of Predictive Astrology propagated by Maharshi Parashar, Jaimini and various other great astrologers in his famous work Phaldeepika. Daivagya Shiromani Pandit Gopesh Kumar Ojha, M.A., LL.B., and a learned astrologer from Mithila (Bihar), translated Phaldeepika in Hindi using his rich experience of sixty years in this field. 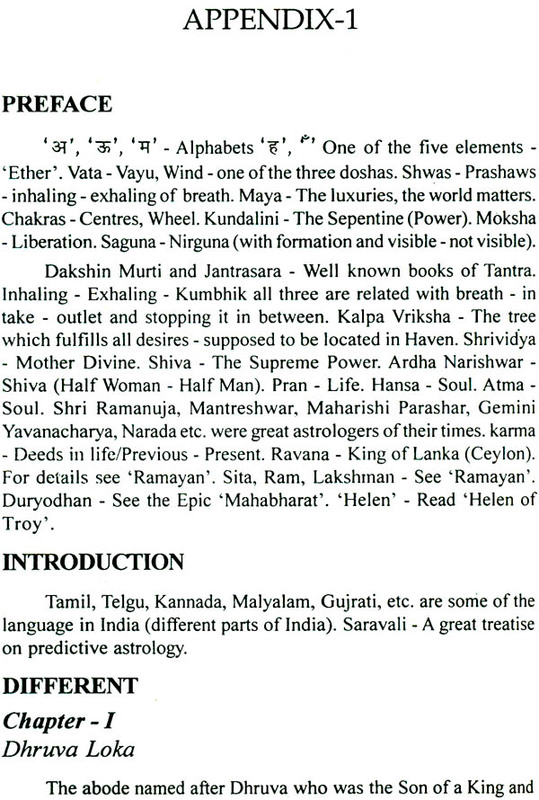 He analyzed the various astrological principles (with his commentary for easy comprehension) and added 450 yogas of Bhavartha Ratnakar of Shri Ramanuja. He also published books in Sanskrit, English and Hindi. Pandit Ashutosh Ojha the son of Pandit Gopesh Kumar Ojha, has B.A. (Hons.) Mathematics, M.A. English and a Ph. D. in Religion. He teaches and practices astrology, enjoying a wide clientele spread over more than 135 countries. He has translated Phaldeepika in English adding some new horoscopes, illustrations and charts. 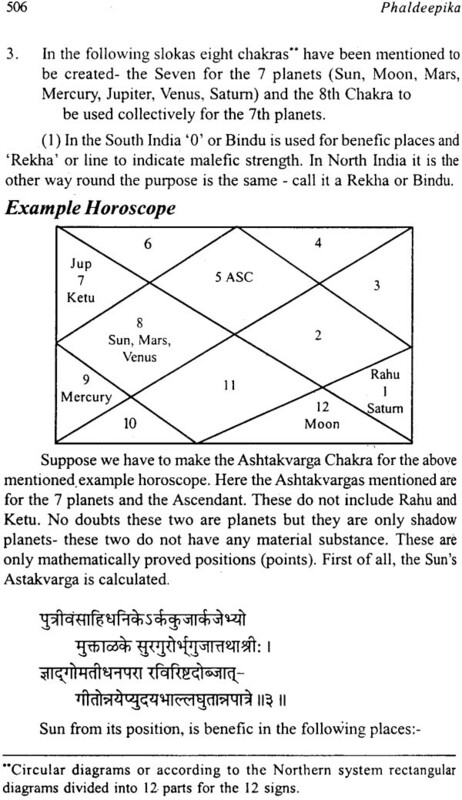 Prayer-correct birth time-comparing the sings of the Zodiac to that of the Kala purush. Places and lordship of signs. Signs of exaltation highest exaltation degree. Debilitation. Maximum debilitation degree. Manushya, Chatushpada etc. Their description, signs rising from the head first, feet first, both ways – attributes of signs- strong during the day/night/movable signs etc.- What signs depict- malefic/benefic etc.- Direction- What matters should be considered from which house. What do Sun. Moon etc. signify? What should be judged from them? Appearance, attributes, nature, direction of planets-their matters, places, birds, trees – natural and temporal friends, enemies etc.- their time, caste, season, grains, country, gems-negative and benefic traits. 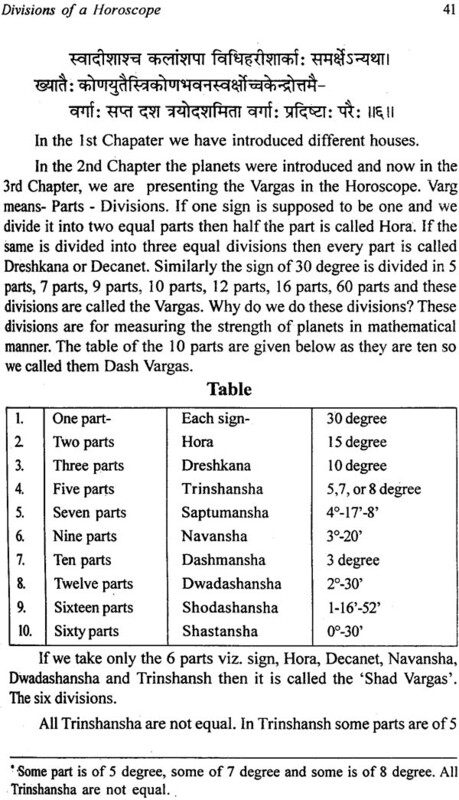 Decanet – signs, Hora, Dreshkana, Five Division, Seven Division, Nine Division, Ten Division, Twelve Division, Sixteen Division, Sixty Divisions – Chart of Dasha – Varga – What should be judged from which Division – Importance of Division – Uttamansha, Parijatansha etc. The Pradipta, Sukhit, Mudit etc. of Planets. Sthanbala-Kalabala-Directional strength-Ayan Bala- Yudhabala, Chesthabala – Natural strength – Drighbala – Bhavabala – Bhavadikbala – Chandra Kriya etc. – effect of Chandra Kriya-Chandra Avastha results. The trend and method of livelihood according to Sun, Moon, Mars etc. Analysis of how and what works. 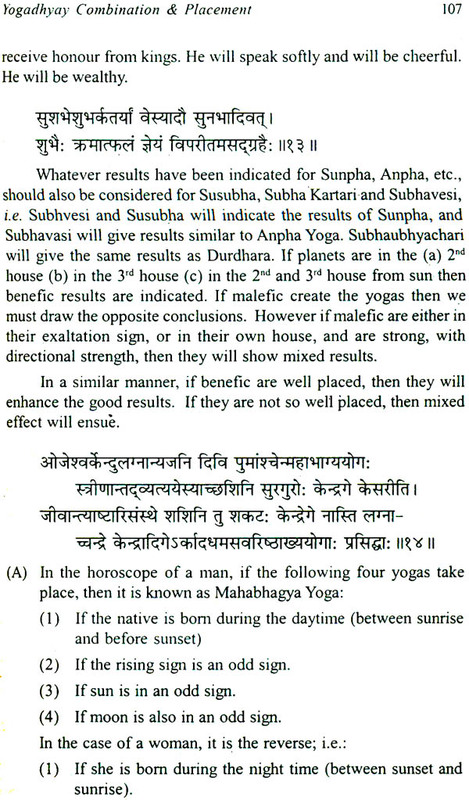 Five Mahapurush Yoga viz. Ruchak – Bhadra – Hansa- Malavaya-Sasha- Yoga of Moon- Sunpha-Anpha – Durdhara-Kemudrum. Yoga of Sun – Veshi- Vashi- Ubhayachari and other yogas – Shubhakartari – Papakartari – Sushuba- Kesari- Adham- Sama-Varishtha – Mahabhagya – Shakat – Vasumat- Amla- Pushkala-Shubhamala – Asubhamala- Lakshmi- Gauri- Saraswati- Shri Kantha – Shrinath- Virichi- due to exchange between the lords of 12 houses – Dainya- Khala- Mahayoga- Parvat- Kahal-Rajayoga-Sankhya- Sankhya Yoga – Vallaki or Veena – Dama-Pasha- Kedar- Shool- Yoga- Gola. Adhiyoga- Chamar- Dhenu-Shaurya – Jaladhi – Shastra- Kama- Asur- Bhagya- Khyati-Suparijata- Musal- Avayoga- Niswayoga – Mriti- Kuhu- Pamar- Harsha- Dushkrti – Saral- Nirbhagya – Duryoga – Daridra- Vimal Yoga. Duryoga (second type)- Interpretations and traits of these yogas. 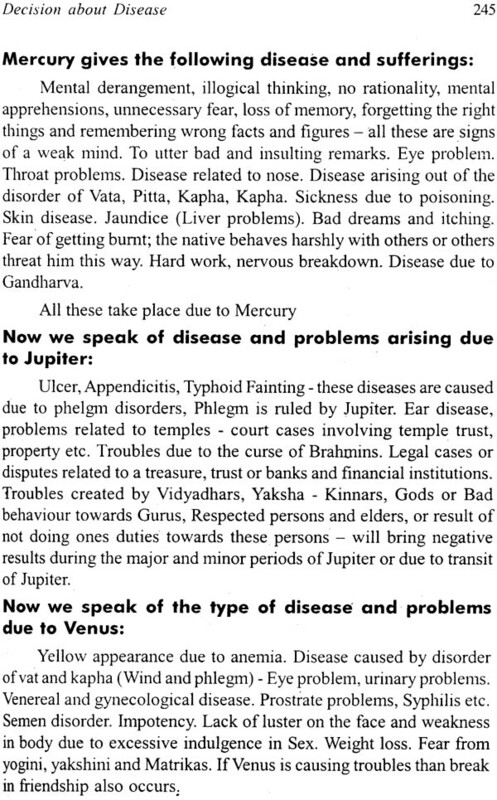 Effect of planets in own sign and in sign of exaltation: Well placed retrograde planets – Rajayoga by planets endowed with directional strength – Vargottam Ascendant and Moon – Rajayoga by lord of the Ascendant – Exalted Moon – Venus in Ashwini – Yoga by Mars in good houses – Sun, Moon in the first half of Sagittarius – Rjayoga by Moon in Navansha of Sun Rajyoga by Moon in own Navansha – Vargottam Moon – Rajayoga by planets posited in the 9th house-Exalted Venus, Saturn-Debilitated and posited in enemy house planets – placed in 3rd, 6th and 11th-Full Moon in Vargottam Navansha – Jupiter, Moon in Angles-Moon in movable water sign Navansha – Aspect of Jupiter on Venus – Mercury receiving aspect from Jupiter – exalted planets receiving aspect from friends - Sun in own Navansha – Moon in Pisces – Moon in Taurus – Aspect of Jupiter, Venus on Moon – Rajayoga by lords of the 11th, 9th and 2nd houses – Neechabhanga Rajayoga. Separated results of Sun, Moon, Mars etc. in the first, second. Third house etc. Results of Ascendant or Radical Moon in Aries, Taurus, Gemini, etc. 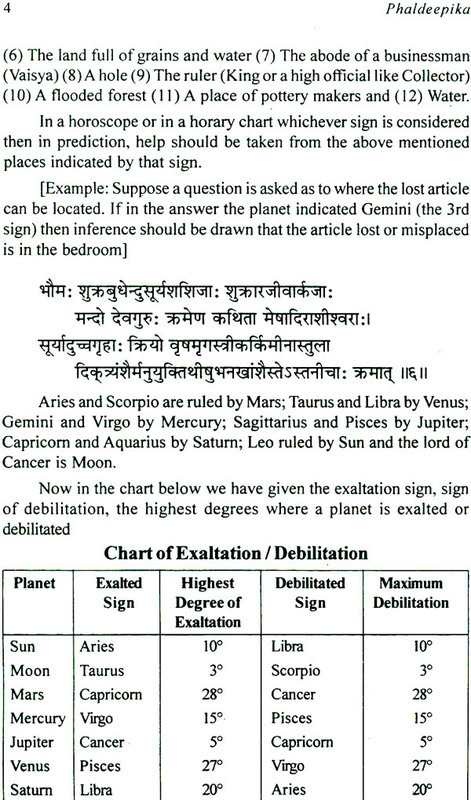 Results of planets when posited in its sign of exaltation, own sign, house of a friend, sign of an enemy, debilitation sign – combust – posited in even signs-retrograde and posited in the Vargottam Navansha. The 5th and 7th house from the Ascendant or Moon-malefic in the 4th, 8th, 12th from Venus – Effect of the lord of the 7th house and planets in the seventh house – Venus in Scorpio- Jupiter in Capricorn – Saturn in Pisces, Mars in Cancer – Saturn – Mars or Venus in the Divisions of Saturn – If Moon, Venus are in the 7th from Mars, Saturn – The number of wife-Combination for the destruction of wife – Moon – Saturn Combination – Debilitated or planets in the signs of enemies in the 7th house – Analysis of planets in the even/odd signs – lords of the 2nd, 7th and 12th houses – Direction of marriage – During the major or minor period of which planet marriage is possible. The major / minor period of which planet will cause the demise of wife. Conjugal Bliss in the horoscopes of women from the 8th house – son from the 9th house – husband from the 7th house – faithfulness in marriage from the 4th house – effect of Ascendant and Moon in the even and odd signs – Combination to marry excellent/low class of person – combination for short time happiness from children-benefic configurations – Effect of Ascendant and Moon according to the Trinshansha – effect due to constellation – benefic effects for in laws viz. mother – in-law, father – in – law, brother – in – law etc. – Configurations for no children. Widowhood. Destruction of children etc. Muhurta for conceiving children. The fifth house from the Ascendant, Moon and the lord of the 5th house – The benefic or ill effect due to their configurations – malefic if in own sign and posited in the 5th house – Other malefic if in the 5th house – If Leo, Virgo or Scorpio falls in the 5th house – Configuration for delay in birth of children (sons) – Child (Son) from the second wife – combination for many children – many daughters – yoga for no issues and end of generation – adopted sons – destruction of sons – Configuration for many sons – time for conceptions – number of children – yoga for birth of children or no issues – negative points to deny child birth due to lunar dates (Tithi), Karan etc. – remedial measure – Maha Dasha, Antar Dashas and Transits time to get children. Difference of opinion as to which time should be accepted as the time of birth – Child mortality up to the age of 12 years and influence of planetary positions in the horoscope of mother and father- Yogarishta – Short life – Medium life – Long life- Dinmrityu – Din ruk – Vishaghatis – Yoga for child mortality – Ascendant – Moon Decanet – Lords of Ascendant and Moon sign Navansha – Lords of Ascendant, Moon sign Dwadashansha – Yoga for short, medium, long life – Longevity consideration due to angular positions etc. 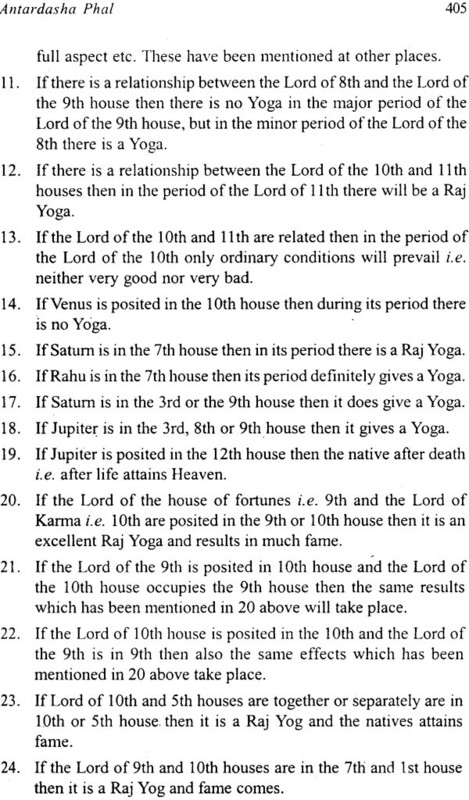 Special consideration of the lord of the 8th house – Lord of Ascendant, Navansha Lord of Ascendant – Lord of Moon sign- Lord of the Navansha of Moon – according to their strength and weakness the longevity decision viz., short – medium – long – timing of death – other yoga. When does a bhava give the best effect? 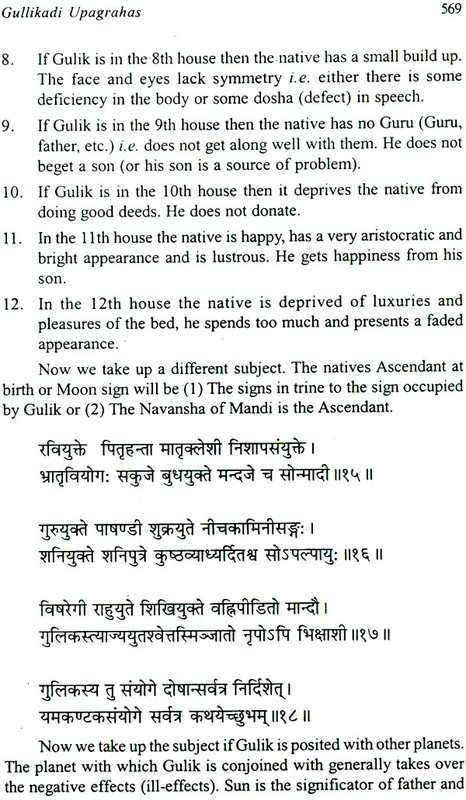 – Signs of a strong or weak bhava – Destruction of a house – timing of the loss of a house – The lord of the Ascendant, malefic or benefic, increases the efficacy of the house it is posited in – The effect of which house first if a planet rules two houses – Planet situated at the mid point of two houses – What does Sun, Moon etc. signify – The significator of Ascendant etc. 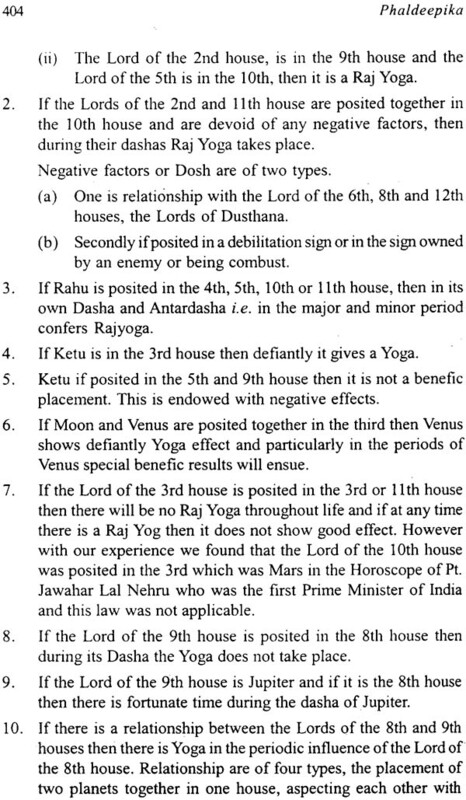 The 12th houses – Special house – Consideration from significator – Counting of 12 houses from the significator and their consideration – If the significator is posited in the house it signifies – If a planet ruling 2 houses is placed in its own sign which is in a good place then it does not show the negative effect of ownership of dusthana – relationship of five types. The good and evil effects of the I house – The effect of benefic relation of the lord of the Ascendant – The placement of the lord of Ascendant in a good or evil house – The effect of second house – The relationship of the lord of the second house with different planets – The effect of the third house – The effect of the conjunction of the lords of the I and III, - Strong lord of the third – Fourth house – Good and evil effects according to the placement of lord of the 4th house consideration of Venus – Fifth house, interpretations according to the lord of the 5th house – lord of the 6th house and the lord of the first consideration of enemies, disease, health etc. 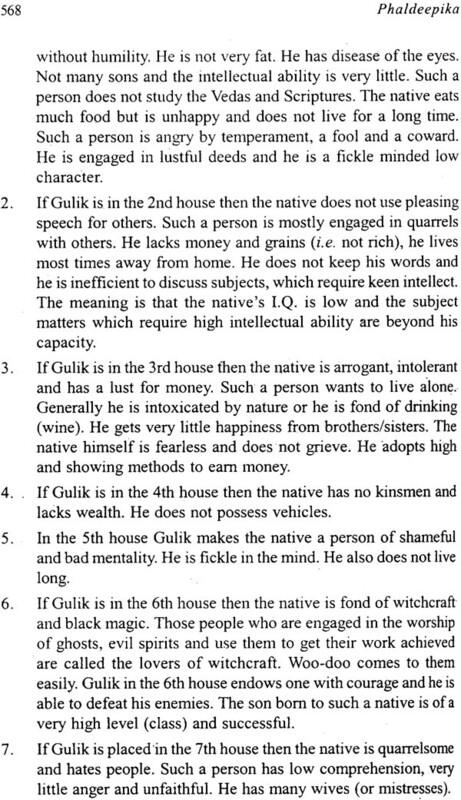 according to their strength – The Seventh house – Good and evil according to the position of lord of the 8th house – The results of the 9th house – happiness from father – will the native be adopted – Consideration of the 10th house – The yoga for the attainment of high status (position) by the native, - Results of the 11th house (of gains) – The results of the 12th house (of expenses) - Timing of fructification of houses – Interpretations according to transits – The position of the lords of I and other houses in transit. The time of destruction of a house – The time of destruction due to the transit of Saturn, Jupiter, Moon – The timing of death due to the lord of the Ascendant, Yamakantak, Moon The sign, degree, minutes of Saturn – The time of death due to Sun and Yama – Kantak – The timing of death due to the longitudes of Ascendant, Sun, and Mandi – Other Yoga (combinations) – The time of death due to Mandi and Saturn – Transit of Sun – Results from the calculations of Jupiter and Rahu – Death related results from the birth Saturn, Venus, Lord of the 8th, Lord of the 12th, and Lord of the 6th house. The result of the conjunction of Sun with Moon, Mars, Mercury, Jupiter, Venus or Saturn – If Moon is with Mars, Mercury, Jupiter, Venus or Saturn – If Mars is with Mercury, Jupiter, Venus or and Saturn – If Mercury is with Jupiter, Venus or Saturn – Jupiter, Venus combination – Jupiter, Saturn combination – Venus, Saturn combination. 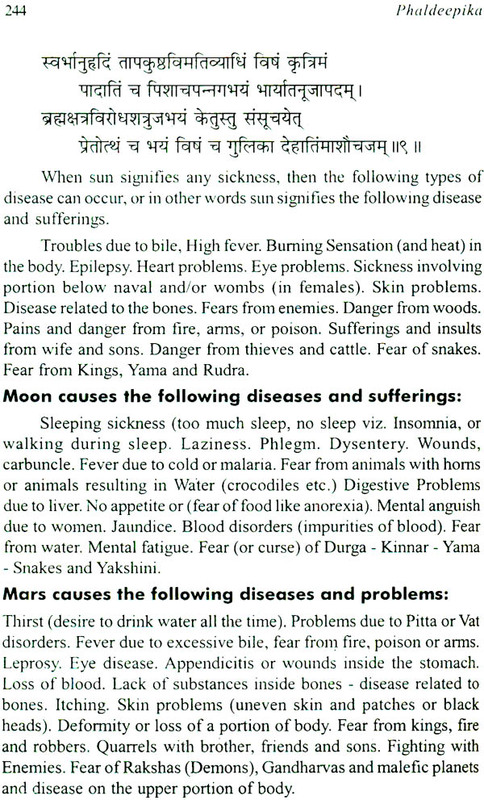 The effect of the aspect of other planets on Moon in various signs. 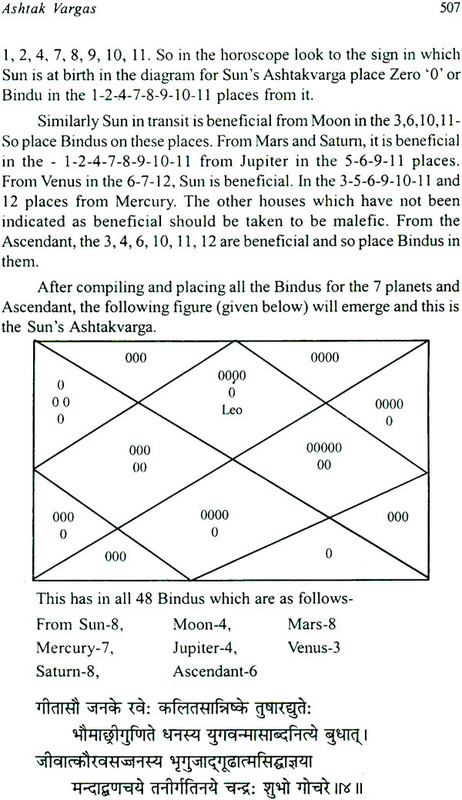 The placement of Moon in different Navansha and the result of the aspect of other planets in it – The placement of Sun in Navansha, Ascendant Navansha – Dwadashansha results. 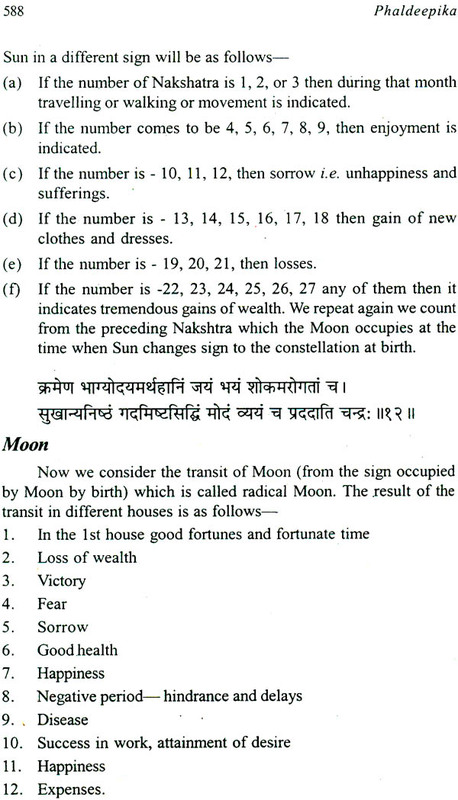 How to calculate Vimshottari Mahadasha – The results of the Mahadasha of Sun, Mars etc. according to the natural traits and characteristics – The special results of Sun, Moon, Mars etc. 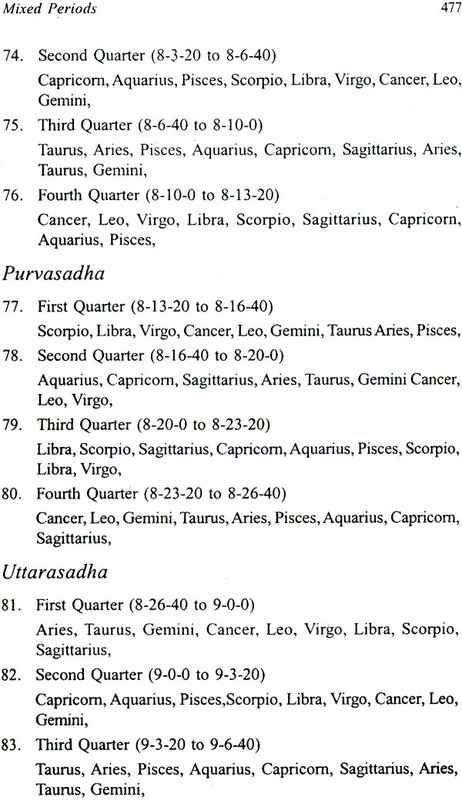 according to their sequence in Vimshottari Mahadasha – Special yogas various Ascendants according to Bharath Ratnakar – 22 yogas for Aries Ascendant – 14 for Taurus – 8 for Gemini – 13 for Cancer – 8 for Leo – 6 for Virgo – 15 for Libra – 5 for Scorpio – 4 for Sagittarius – 9 for Capricorn – 8 for Aquarius and 10 for Pisces Ascendant. The method to calculate minor and Sub-periods of Planets – The nine minor periods in the major period of Sun – Sub periods in each minor period – Minor and Sub periods in the major period of Sun – Minor periods in the major periods of Moon and Sub periods in every minor period – Nine minor periods in the Major periods of Mars and Sub period in the minor periods – Sub periods and minor periods in Rahu’s Major period – Sub periods and minor periods in the Major period of Jupiter – Sub periods and minor periods in the Major period of Jupiter – Sub periods and minor periods in the major periods Saturn, Mercury, Ketu and Venus. Kalachakra major periods, minor periods – Duration of Major Periods – method of calculation of elapsed and balance periods – The sequence of various signs depending upon the quarter of every constellation – duration of each sign – minor period in every major period – logical effect due to the lord of a sign – effect due to transit – Various movements – Detailed definition of all these with examples – Adhan as well as major periods as a result of 5th and 8th constellation from the birth star – Nisarga Dasha – Ansha Dasha – Opinion of Satyacharya – Pindayur Dasha – Opinions of Jeeva Sharma, Marretha, Chankya, Maya etc. Principles of Transit through Ashtakvarga – The process of casting the Ashtakvarga of Sun, Moon, Mars, Mercury, Jupiter, Venus and Saturn – Upachaya – sign of friend, own or in Venus and Saturn – Upachaya – sign of friend, own or in Anupchaya, sign of an enemy or debilitated planet – logical in their interpretations – The good or evil effects of one or more points (Bindus) – to decipher beneficial or evil results by making a planet as ascendant – Eight class of every sign – good or bad times as per the class – Sarvashtak Varga – with example. To decide the good or evil times of father, mother, brother etc. 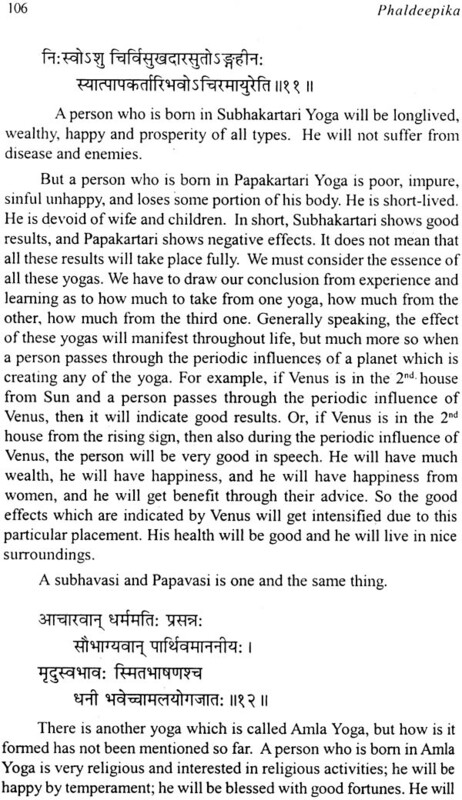 The method of knowing the good and bad years from the Ashtakvarga – The success of marriage if one marries in a particular sign or direction – Trikona Shodhan, difference between the North Indian system of Parashar and that of the South Indian system of Balabhadra the writer of ‘Hora Ratnakar’ – The views of Mantreshwar – The view of ‘Prashnamarga’ – Trikona Shodhona with commentary and example – Ekadhipatya Shodhan –sign, planet multiplier – various interpretations from these. The mathematical method of calculating the Gullika or Mandi- Yama, - Kantak, Ardhaprahar, Kala, Dhoom, Vyatipata, Parvesh or Paridhi – Indrachap and Ketu – The process to calculate all these – The effect of all these in different houses. The importance of Moon Ascendant, The benefic and evil places of the transit of Sun, Moon etc. 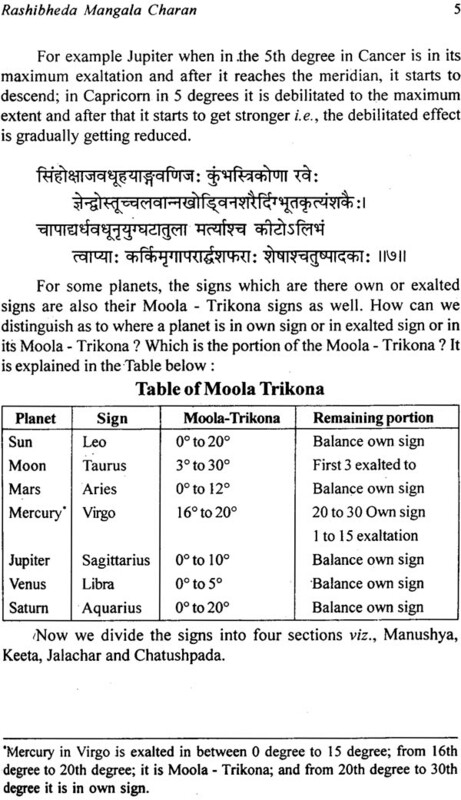 from the Moon sign (the sign where Moon is, used as the Ascendant) – The effect of Vedh – The good or bad effect of planets in various houses from the Moon Ascendant – Constellation – Transit – Saptashalaka – Consideration as per Birth, Adhan, Karma and Vainashik – Janma-Anujanma, Trijanma Consetllation – Planetary War-Ulkanipat – The transit effect of various planets in different constellation from the birth star – Latta effect. Construction of the Sarvatobhadra Chakra – Effect due to transit – With complete commentary. 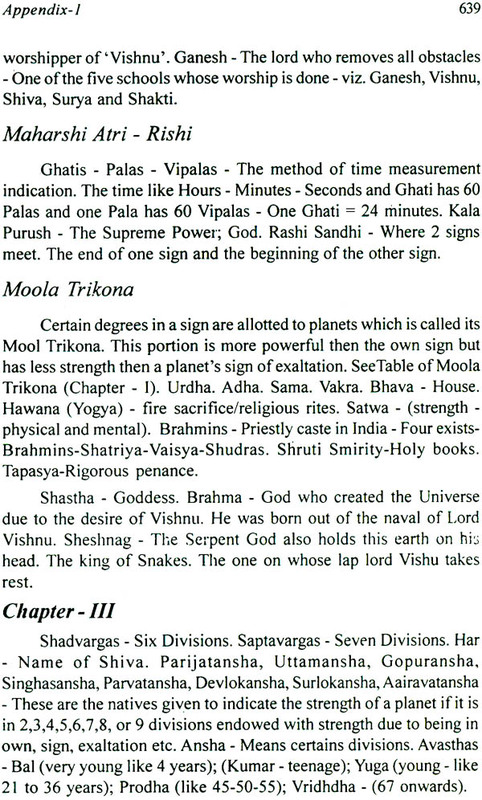 Combination of four planets – The effect of the rise of the last portion of a sign – The Sanyas of the strong planet – The effect due to the decanet of Moon – if the Moon sign receives aspect of Saturn – The type of Sanyas according to the strongest of Sun, Moon, Mar etc. – The Tapaswi Yoga – If both the Rajyoga and the yoga for renunciation, both are present in a horoscope-Sanyas Siddhi i.e. attainment and success in Sanyas. The details of various topics discussed in details by the Writer of the book.